Candidates for the Asenso for Better Bacolod-Magbinuligay Kita sa Kauswagan (ABB-MKK) coalition filed their certificates of candidacy (COC) yesterday at the local Commission on Elections office, where former City Councilor Jocelle Batapa-Sigue was announced as their candidate for mayor, setting up a showdown with incumbent Bacolod City Mayor Evelio Leonardia. “For me, it is not only a question of whether I can win or not – it is more about whether Bacolod can win or not,” she said. The former city official said she wants to help the city overcome recurring concerns and issues that have been poorly addressed. Meanwhile, former Bacolod City Mayor Monico Puentevella entered the race for Bacolod City lone district representative, a position he held from 2001 to 2010; and former Vice Mayor Jude Thaddeus Sayson will also be running to retake his previous post. 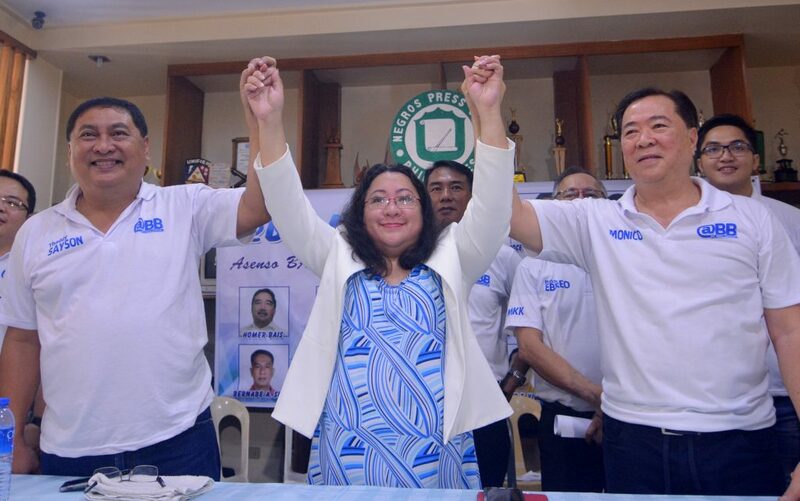 In addition, the ABB-MKK Sangguniang Panlungsod line-up includes incumbent Bacolod City Councilors Wilson Gamboa, Jr. and Claudio Jesus ‘Kalaw’ Puentevella, former City Councilor Homer Bais, Edwin Balajadia, Reynaldo Ebreo, Rommel Jamero, Bobby Montelibano, Bernabe Sibug, Rico Villafuerte, Elmer Villanueva, and Jason Villarosa.